EXCLUSIVE Viola Back to Black (RRP £2.35 for 100 seeds) Mini flowered and on small, neat plants the petals are truly jet-black and beautifully contrasted with a bright yellow eye. 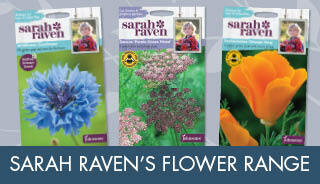 Flowering over an extremely long season, they are perfect for all baskets, patio containers and dramatic bedding displays. Nasturtium Red Troika (RRP £2.35 for 25 seeds) A deep red variety with semi-trailing variegated foliage, perfect for mixed containers and summer borders. Brachcome Blue Star (RRP £1.85 for 200 seeds) A half hardy annual selected for its pretty star shaped flowers, they are a perfect addition to a sunny border or mixed container. Cornflower Classic Magic (RRP £2.35 for 200 seeds) is a highly unusual, harmonious blend of colours which make an ideal filler for a border or as a cut flower. For summer long displays, Silene Blue Angel (RRP £1.85 for 1,000 seeds) provides eye-catching electric blue flowers. 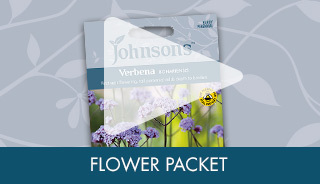 Our packets feature icons including the RHS Perfect for Pollinators logo and each standard packet has the FREE colour plant label to help identify each plant, which gardeners love, now on the back of the packet. 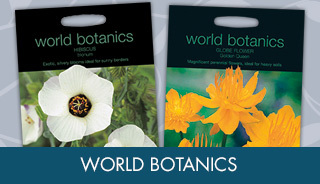 Johnsons also offer a number of other flower ranges, for incremental sales, including World Botanics and Sarah Raven's Cut Flowers and Wildlife Attracting collections.